The fliers exist, but they don’t have any authority. 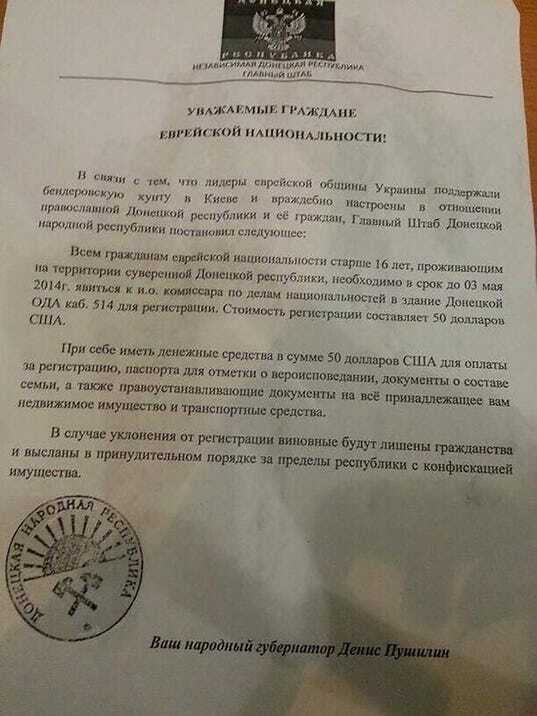 A flyer demanding that Jews in the Ukrainian city of Donetsk register with its pro-Russian government is “fake,” a Jewish advocacy group with direct contacts in the region tells the Daily Dot. First reported Thursday by Israeli news organization Ynet and republished by USA Today, the flyers do exist, according to Weiss. But they carry no authority and were not sanctioned by the city’s temporary government. “It’s not true that they have to register or be deported,” says Weiss. NCSJ officials spoke directly to Jewish leadership in Donetsk, who said that Denis Pushilin, chairman of the pro-Russian Donetsk People’s Government, denied creating the pamphlets, which carry his name. Instead, Weiss says, the flyers were distributed simply to “cause anxiety” among the city’s Jewish population. In an online announcement about the fliers, NCSJ said similar fliers were recently handed out to students at a nearby university. “You can image the anxiety it’s causing,” she said. Weiss says that her office is “in contact” with the U.S. ambassador and that his statements agree with what the NCSJ learned from Jewish leaders. The “real deal” comment, she says, was likely a mere acknowledgement that the fliers do exist, not that they carry any authority imposed by the Donetsk People’s Government. Updated with additional comments from Weiss for further context. | Correction: Weiss says that NCSJ did not speak directly to Pushilin, but instead spoke with a local Jewish leader who said the separatist denied creating the leaflets.